A statue of suffragette Alice Hawkins – we’re almost there! We are very pleased to have another blog from Peter Barratt, great grandson of suffragette Alice Hawkins. Peter has been bringing her amazing story to life through talks and, this summer, performances at Edinburgh Festival. Now he gives us an insight into the making of her statue…. After much debate and argument over whether it should be suffragette leader Emily Pankhurst or suffragist leader Millicent Fawcett whose statue should be first to stand in Parliament Square, readers of UK Vote 100 blogs will be well aware that the recently granted planning approval means it will be the statue of Millicent Fawcett that is unveiled next February in the Square on the centenary of the Act of Parliament that finally gave women the right to vote. No decision has yet been made regarding the planning application for the statue of Emmeline Pankhurst. 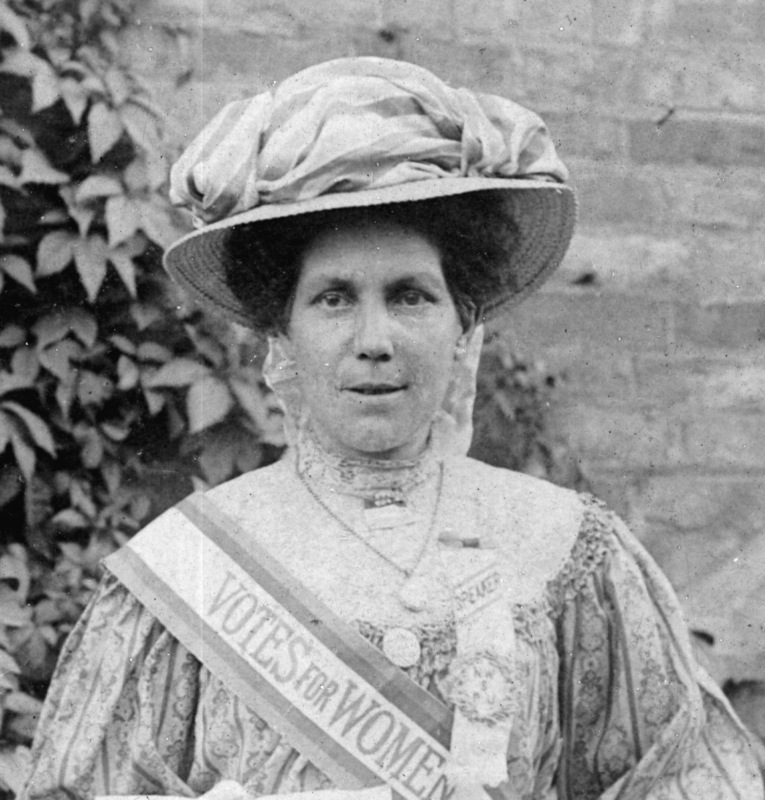 The issue has been much covered in the media over the past few months, however what has not made national headlines to-date is that there will after all be a statue of a suffragette unveiled in the UK next February, of my great-grandmother Alice Hawkins. Whilst statues both of Millicent Fawcett and Emily Pankhurst give them true credit as leaders of their respective organisations, it can be rightly said that a statue of Alice will indeed be representational of the working class rank and file suffragettes of a 100 years ago. Alice, a shoe machinist by trade and mother of six, campaigned throughout her life for equal pay for the women in the shoe factories where she worked, she joined the suffragette movement in 1907 and became the founder of the WSPU branch in her home town of Leicester. Recognising her contribution to the campaign for women’s rights, I was approached some four years ago by local councillor, Adam Clarke, and asked if I would join him in a campaign to raise funds for a statue of Alice, to be sited in the city market place where the suffragettes held their public meetings over a 100 years ago. The early fundraising years were hard and rocky but late in 2015 Leicester businessman, Jamie Lewis, who today owns the very building where Alice worked all those years ago, came forward and offered to fund the statue in full. A true benefactor and so we now had a funder, the backing of the Leicester City Council (who offered to fund the plinth and provide the site) and after a short selection process, a sculptor in Sean Hedges-Quinn. Things were very quickly dropping into place, but when we worked out the project timescales, another major gain was realised. With a following wind, its completion and unveiling would coincide with the very date of the centenary of the 1918 Representation of the People’s Act, giving some women the vote for the first time. I recently described this to a friend as a confluence of events and timing, but was told that it was in fact serendipity. Not knowing the word, I looked it up. She was right. Fast forward to just a few days ago as I travelled from my home in Northamptonshire to Sean’s workshop in Suffolk. For as part of a small group that day we were to view the full sized clay statue for the first time and, if OK, give it the thumbs up to be sent off to the specialised foundry to be cast in bronze. We had all viewed the scale model (maquette), a month or so ago, but today we were to see it for the first time at life size and a quarter. Over seven feet tall. Arriving at the workshop Sean asked us to wait in another room for a few minutes and then finally invited us in to view the statue. Whilst an outgoing character by nature, on seeing it I found myself lost for words for several minutes as it was awesome in its size and pose. Recognising that Alice would be sited at the very spot in the market place where she would have spoken out to the crowds, urging them to support the women’s cause, the statue of Alice had been designed with a formidable stance and posture. Not only was it impressive in its size and design, the attention to detail was second to none and we all spent some time circling the statue, highlighting the features such as her boots, the sash and the ‘Gates of Holloway Jail’ brooch that Alice wore all in her life in commemoration of her campaigning years. After years of fund raising and speaking to schools, groups and societies on the inspiring life of Alice Hawkins, the day of the unveiling will soon be here and will be the day of days and one to remember. And finally and for those who have followed the debate on whether the statue in Parliament Square should have been Emily Pankhurst rather than Millicent Fawcett, I add this for thought. As a young boy, over fifty years ago, I remember my grandfather speaking proudly of his suffragette mother’s fight for ‘the vote’, but he told me that he truly believed throughout his life that it was the contribution of women in the First World War, going into the factories and on to the land, that convinced the government of the day to give women the vote in 1918. So whether we unveil statues of suffragettes or suffragists in centenary year, all are welcome and should truly be recognised for their contribution to the campaign for women’s rights. Brilliant! Such inspiring women that need to be more widely taught about! Young women need to learn exactly why we should vote!